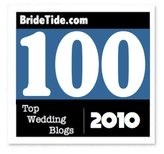 Relentless Bride® Weddings, Wedding Planning, Life & Marriage: Say no to Bridezilla!!! Yes to Weddzilla!!! 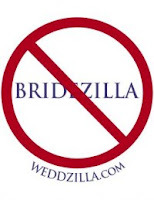 Say no to Bridezilla!!! Yes to Weddzilla!!! These were the pins given to you as soon as you walked through the Door at the Clarendon Ballroom!!! 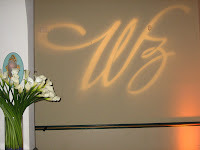 To say that the Weddzilla Launch Party was a success would be an underestimation in my opinion! The party started at 7pm, and I'd say there were many brides and "support groups" there by 7pm, if not earlier (I myself arrived at 6:45pm). As most parties have drifters who end up coming in late, it's obvious that Brides-to-Be (BTB) are not part of this group. BTB's at this event were definitely about being on time and scouting out and meeting the Weddzilla Launch Partner Vendors who were present. 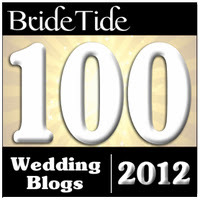 I thought this was pretty cool as it imitates the Weddzilla logo PERFECTLY! We then moved on to the Chocolate Fountain! The Chocolate Chick (Owner Hilary B. Bradley) provided a display that everyone could take samples from... including fruit, pretzels and CREAM PUFFS!!! DELICIOUS! We all know that my Mr. Perfection (who does not like chocolate) has already demanded the Chocolate fountain after trying one at his friend's wedding. That being said... with my SIL and FSIL avid chocolate lovers, the Chocolate fountain is in!!! During the schmoozing time, there were fancy (and delicious) Hors D'Oeuvres being passed around. The party also included white, red and sparkling Italian wines to go with the delicious food. I stopped by DerMediSpa booth and got some info for some skin care needs. It's never too early to start fixing things or preventing things ;) The ladies there were very nice and gave out little bags of goodies! 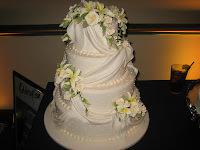 I had to take a pictures of this one centerpiece b/c it was so dramatic and so well done. 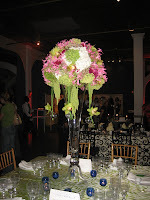 It was set on tables done by DC Rentals and the Flowers from MulitFlor. The tables were displayed to show the various way to elegantly and creatively create your reception space! And luckily, not only did I enjoy great drinks, good food and awesome delectable desserts all night, I also won!!!!!!! (And i never win!!!) I won my own $250 credit towards The Dandelion Patch. 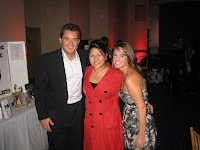 I also met Aaron and Kristen, the founders of Weddzilla. These two are brilliant for coming up with a concept that actually tries to make it EASIER on the bride! And finally... after a wonderful night with some great vendors, meeting some cool people, tasting some great samples, and eating and drinking to my heart's content, and WINNING my raffle prize... It was time to go home! That's me next to the sign on the door... Happy after a very eventful evening! Thank you for your nice comments. What a cool site and blog. Chocolate fountains are very popular in Califormia so I am sure you will find a good vendor. 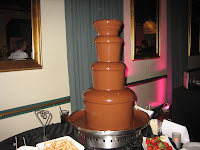 don't you know the chocolate fountain is the ONE thing the frogman absolutely had to have at his wedding?? he said he had sworn to himself he'd have one at his wedding after he saw one on an episode of the simpsons!